I did the tourist thing this morning in Port Macquarie and went for an Eco-tour up the Hastings River and into the Limeburner’s Creek National Park. It was a two hour cruise and it only cost me fifteen bucks. What a bargain! I actually really enjoyed it. I saw three different raptors and heaps of cormorants. I am putting this shot in to show the brown mottling across the chest of this bird. The captain of the boat said it was a young male, but I am not sure. 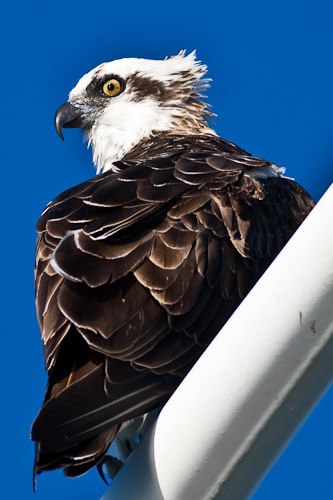 The female Osprey is larger than the male and this is fairly typical for raptors. This gives the breeding couple more range of prey. 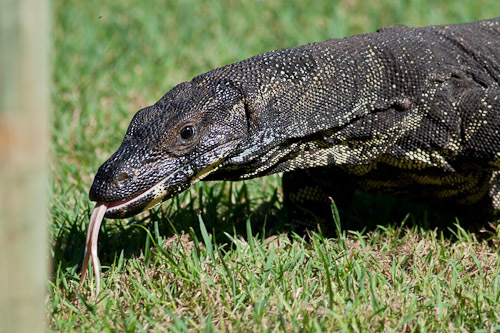 The female can go after the larger prey while the male gets the smaller stuff. We saw two Osprey nests. 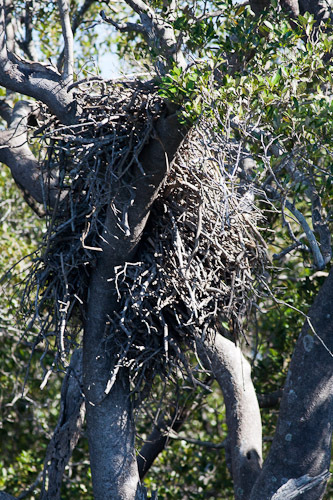 The other one had fallen down after a branch broke that was supporting the nest and the pair had to rebuild. 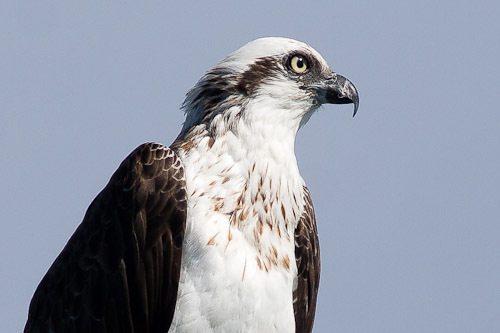 Osprey numbers are increasing along the Australian coast. I think there are more this year than just a couple of years ago when I last went up the coast. This one has the blue eye-ring and the yellow in front of the eye. That and the pants are the main identifying features. And of course, he is drying his wings out. I have seen more Little Black Cormorant in this estuary than at other places along the coast. 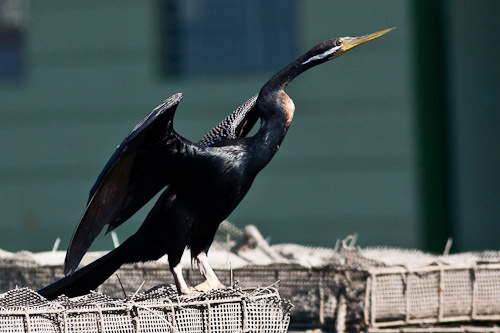 They congregate in larger flocks than other cormorants. This one is ready to take off. 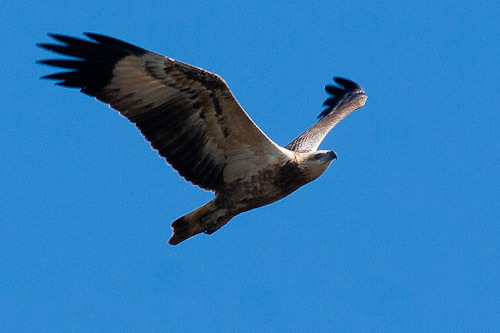 This one is a very young White-bellied Sea-eagle, possibly first year. I thought this was a female because of the large size. When immature, they are brown with lighter markings. They are very different to mature birds. A look at the creek with the mangroves along most of the it. Kattang Nature Reserve is a track that goes to Point Perpendicular at Camden Haven on the mid-North coast of New South Wales. It is typical coastal scrub with lots of banksias etc. 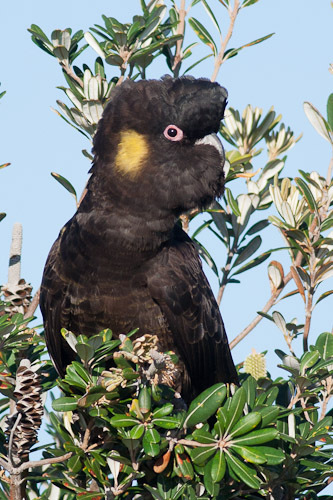 I did not see much at first so I thought it was going to be a bit of a dud, but I happened across a few Yellow-tailed Black-cockatoos, so that made me happy. 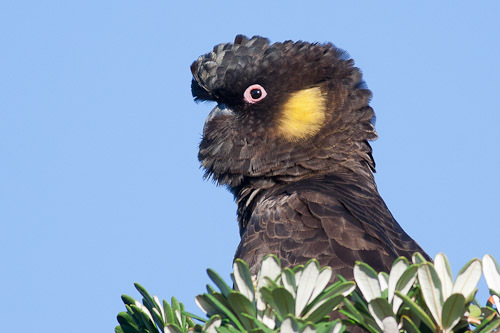 The Yellow-tailed Black-cockatoo has a very long tail with yellow panels. doh! 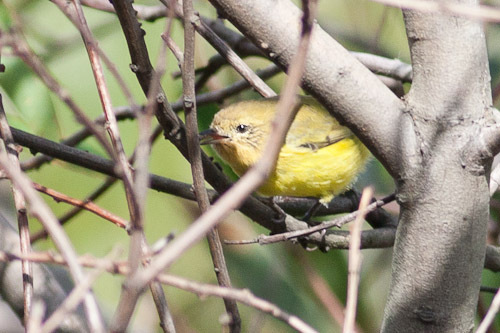 They have a pink eye-ring and the female has a larger yellow cheek patch. 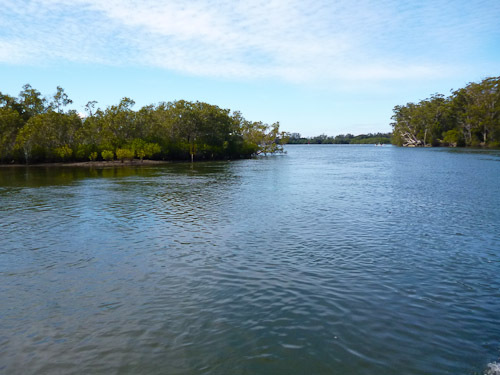 Saltwater National Park is a beautiful spot right next to the beach and an inlet. It is a very special place. I headed off with my mp3 player blaring and my sunglasses stuck to my face. I quickly got rid of them when I sighted my first bird. It is a bit hard to hear the birds with Groove Armada blaring away in your ear-holes. 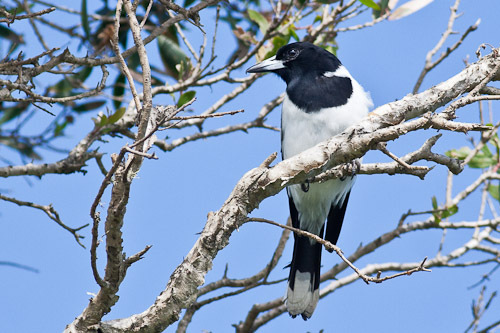 This Pied Butcherbird was hanging out checking out the surf and singing a beautiful morning song. I love their singing. I had been hoping to see the Regent Bowerbirds that hang around the picnic area. I did see the yellow flash but they were gone before I could get the camera up and firing. The next day I did manage to get a shot of the female Regent Bowerbird, but the male is the spectacular show piece. I like the tongue flicking in and out. Last time I was here there were a pair of White-bellied Sea-eagles soaring around the inlet. But this time there were a pair of Ospreys. It made me wonder how raptors guard or defend their territories and if they fight other raptors when they invade their territory. 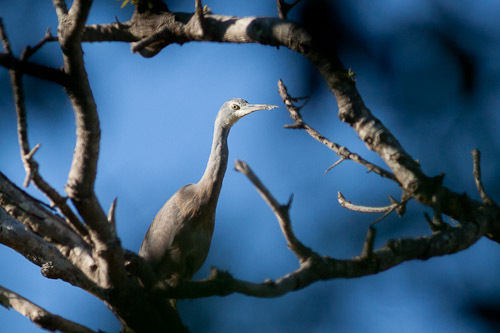 I managed to get a shot of a White-faced Heron up in a tree. I do not usually see them up in trees. I thought it was quite unusual. This one is an adult. I am pretty sure this is a juvenile mainly because of the smaller size, the not-so-glossy lesser black feathers and the white spotty bits. I like this photo because of the way he is flaring his tail. I have no idea what that is all about, but it is cool. 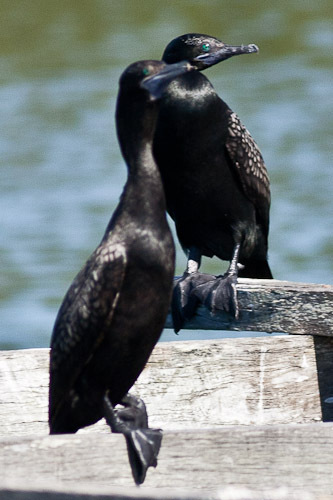 Some birds from Forster, which is on Wallis Lake, situated at the Mid-north Coast of New South Wales. This is where the lake empties into the sea. 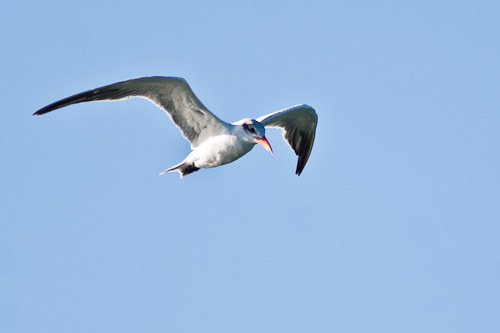 I think this one is a non-breeding male or a young Caspian Tern because it does not have the full black top of the head. They are a rather large tern with a stout red bill. They are found in most continents all over the world. Their habitats are coastal areas, lakes, and large rivers. They feed on small fish that they catch by diving. 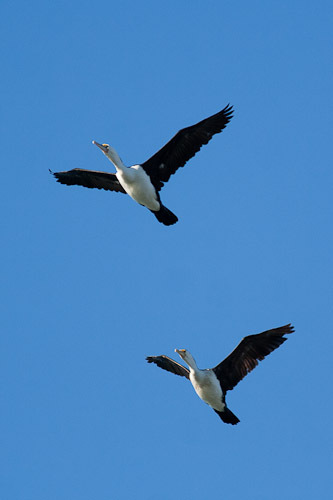 There were three Pied Cormorant flying over the bridge. 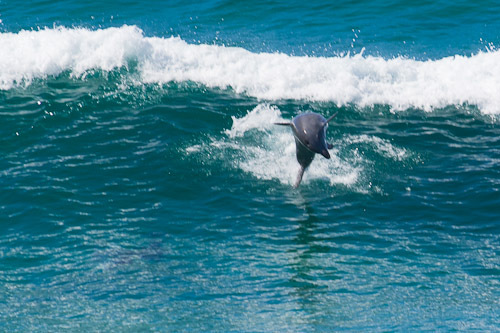 They are restricted to mainland Australia with some in New Zealand. 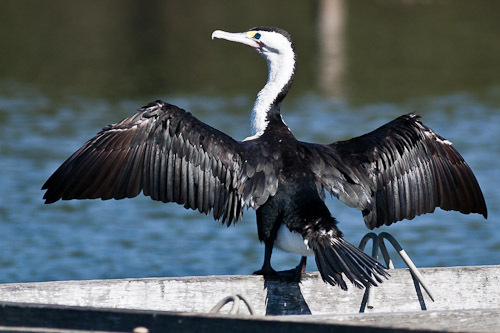 Their habitat is coastal and inland bodies of water. They feed by diving under the water and chasing fish under the water. You can often see them spreading their wings to dry on shores. 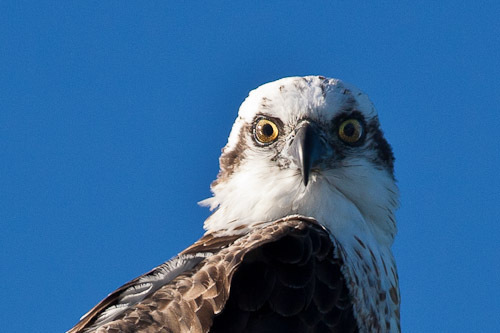 This Osprey had been hanging on a light on the bridge for days. After I took these shots, it flew to a huge pine tree on the side of the lake, where a young one waited, screaming out to be fed. 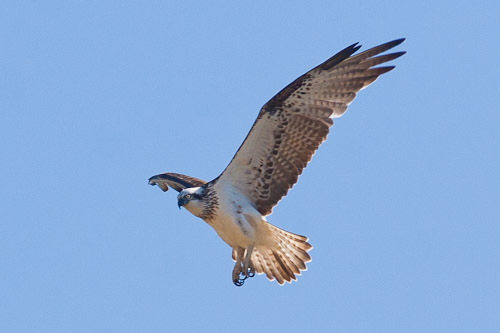 Ospreys are distributed throughout most of the world. 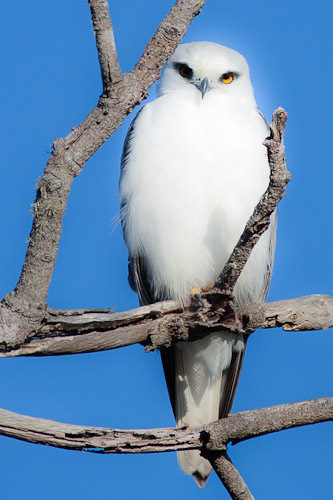 They feed mostly on fish, which they catch by plunging from above and grasping them in their talons and flying off to a roost, where they are eaten. The swell has dropped this morning and the wind still had a bit of west in it just before lunch time. I could not make up my mind whether to go to Bar Beach or Merewether, so I decided on Merewether. The shore break had a few hollow waves but it was very crowded. 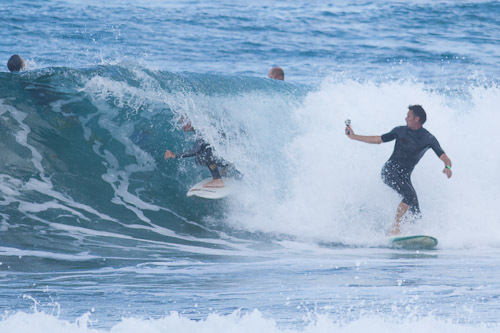 This guy had the ubiquitous go-pro and was taking off and filming people in front of him. At least it was not another Point-Of-View shot! The swell picked up today. It was coming from the East with the sets being up to six foot. The wind was pretty light so the waves were standing up nicely. This wave breaks right in front of the rockpool, just east of the Foster Beach. 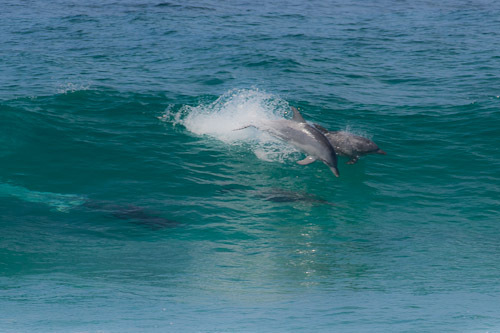 This morning a big pod of dolphins came into Boomerang Beach and started surfing the waves with all the surfers. I rushed and grabbed my camera and took some shots of them down the beach a bit. The waves were looking pretty good down the beach and the shore break was getting hollow at times. Borah Creek and Stockton Sandspit. Here are some very widely spread birds from the beginning of April. I went up the mountains to the north-west of Newcastle and then came back down to the Hunter estuary at Stockton Sandspit. 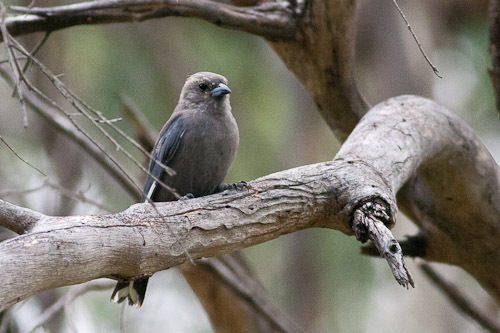 Dusky Woodswallow (Artamus cyanopterus) has a distinctive white stripe at the edge of the wings. 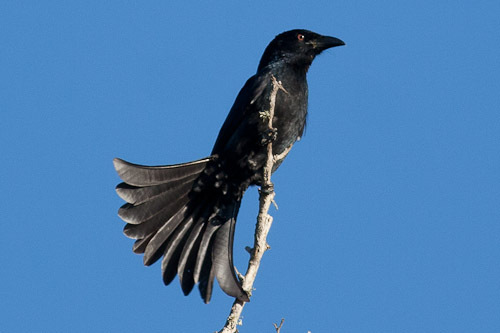 In flight, the body, head and tail are dark in contrast with the almost white under-wings. Their habitat is dry open forests. 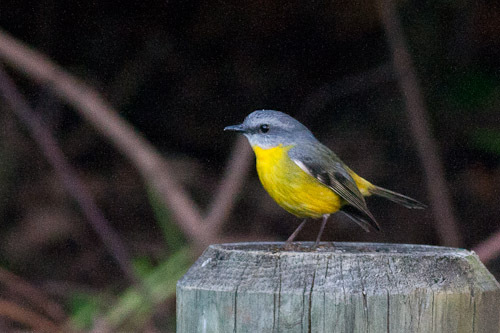 Also seen were lots of White-plumed Honeyeater, Superb Fairy-wren and Diamond Firetail. 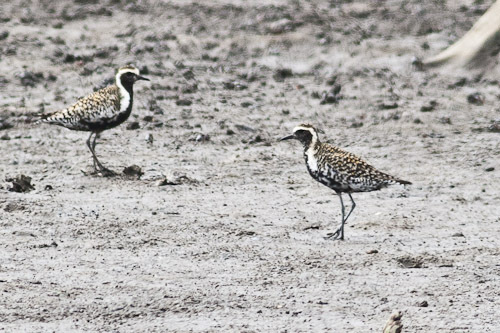 These Pacific Golden Plover were in breeding plumage. 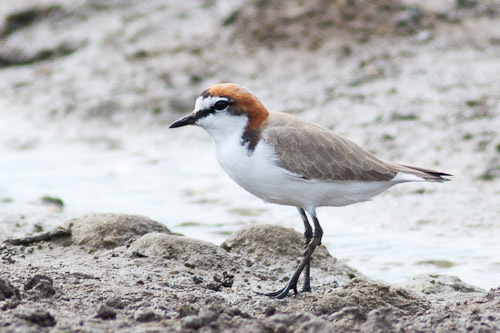 I am not sure if the others were non-breeding or Grey Plovers. 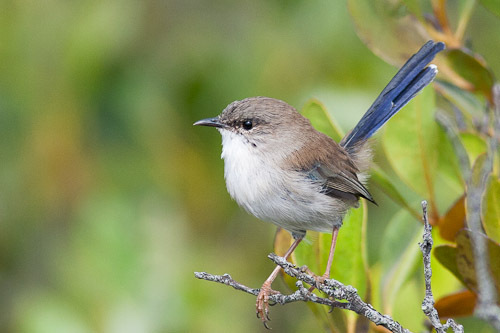 This Superb Fairy-wren is a non-breeding male. 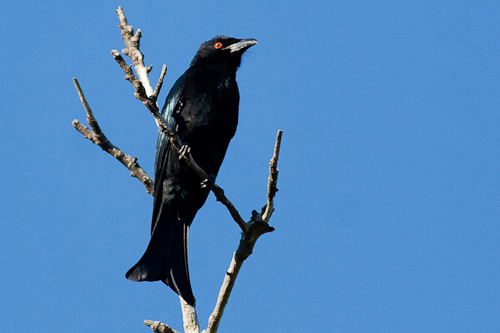 No red eye-ring and blue tail feathers. The white tip on the tail made me suspect variegated for a while but I do not think so. 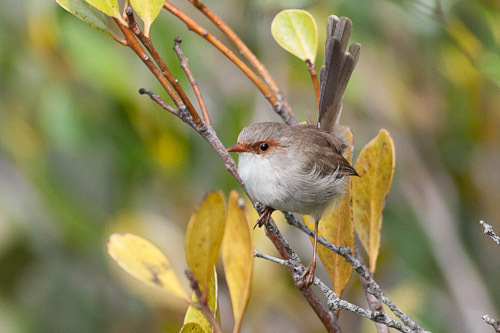 A young female Superb Fairy-wren. You can tell by the reddish eye ring and the dull brown tail feathers.